World Heritage is the shared wealth of humankind. Protecting and preserving this valuable asset demands the collective efforts of the international community. This special day offers an opportunity to raise the public’s awareness about the diversity of cultural heritage and the efforts that are required to protect and conserve it, as well as draw attention to its vulnerability. Stonehenge and Avebury was inscribed onto the World Heritage List by UNESCO in 1986, along with 6 other sites in the UK. Over the past 3 decades there have been a number of achievements by the many partners who share in the protection and enhancement of the Stonehenge and Avebury World Heritage Site. World Heritage Sites are cultural and natural sites of international importance described by UNESCO as being of Outstanding Universal Value. They represent the common heritage of the international community. On signing the World Heritage Convention, governments pledge to protect and present their Sites for this and future generations. UNESCO grants the prestigious World Heritage Site status to sites that meet its strict international criteria. Today there are over 1,000 World Heritage Sites including the Pyramids, Machu Picchu, the Great Wall of China and the Amazon River Basin. The UNESCO website provides more information on World Heritage Sites across the globe. You can find out more about Britain’s World Heritage Sites on the UNESCO website. Previously it was planned to go south of the stones but there were concerns this would intrude on the view of the setting sun at the winter solstice. Historic England, the National Trust and English Heritage said “if designed with care”, this would “restore peace and tranquillity” to the landscape. But campaign groups have called for a “complete rethink” to the plan. They fear the work will mean the area will lose World Heritage Status after Unesco, the organisation that decides on such sites, said the tunnel should be “reconsidered”. Unesco has previously backed the option for a bypass to be built. What is new in this plan? Plans to build a tunnel under Stonehenge have been welcomed in an influential report. The report by UNESCO and the International Council on Monuments and Sites recognised the benefits the 1.8m (2.9km) project. In 2014 the government announced it would commit to building a tunnel, removing the A303 from the landscape. Historic England, the National Trust and English Heritage also support the plans. The report highlighted the scheme’s potential to become a “best practice case” for a World Heritage Site. It said the scheme must “both protect the outstanding universal value” of the site and also “benefit road users”. At the moment the congested A303 cuts through the middle of the area. Helen Ghosh, director general of the National Trust, said the report “recognises the unmissable opportunity” the government’s road improvement scheme offers to address “the blight of the existing A303”. Duncan Wilson, chief executive of Historic England, welcomed the report but said “sensitive design” would be needed. LIVE! Catch the sunrise at Stonehenge. With Dan Snow #Dronehenge #Periscope. Stonehenge is a magical place to be, steeped in mystery and History. We’re delighted that English Heritage have given us special access to film from this ancient stone circle, a UNESCO World Heritage site. Live on March 2nd from 6 am. The sunrise is at 6:50 am GMT. How do we let people, a lot of people, know about a very special live event that is only happening online without a massive marketing budget? How can live streaming compete with the mass of distractions out there? There’s no TV schedule. No billboards. No iPlayer for this sort of thing. If you haven’t watched one of Dan’s ‘scopes’ you haven’t experienced the tangible excitement ‘live’ brings to the show. It’s more than a show. From under the bow of the Mary Rose – where they installed wifi especially, to the extraordinary views at Gallipoli, scrambling through the underbrush in Harfleur in the search of Henry V’s battlements, to the cacophony on an airborne Lancaster bomber -one use in infamous Dam Buster raid.Dan Snow takes you to places other broadcasts cannot reach. Armed with just his iPhone and a respectable 4G signal, Dan is liberated from the traditional film crew and all that goes with that. Periscope is the app that’s made this possible – in just under a year Dan Snow has filmed almost 100 ‘scopes’ from all over the world, to a global audience. Dan Snow is the resident ‘history guy’ for the BBC’s ‘The One Show’. When we heard Periscope had teamed up with action camera company:GoPro we got excited. We could now ‘hand-off’ to an external camera wirelessly – our synapses began to fire. What could Dan do with an external camera that would enhance the form? We’d seen GoPros – these matchbox-sized cameras with a high fidelity camera – strapped to skiers helmets, screwed to BMX bikes, and stuck on surfboards. What could Dan do to create stunning visuals, to enhance the story, and where should he take it? “It’s got to be a drone, and it’s got to be Stonehenge,” said Dan, without missing a beat. After a month of phone calls, planning, testing, tinfoil, and tech-wizardry, we’re ready. And with help from Periscope – we’re delighted that Dan will be able to do something during the live stream that would have been impossible to do otherwise! You’ll have to wait and see! Tinfoil? Yep! The limitations of wifi range between the iPhone and the GoPro, signal frequencies of the drone (don’t cross the streams! ), we’ve learned some expensive lessons. Falling down 7 times and getting up 8. After all the planning and testing we’re ready. We hope you will join us on the ‘scope’. We would love it if you’d help us spread the word by joining this Thunderclap! Thank you! Follow Visit Stonehenge on Persiscope. PLANS for a 2.9km tunnel under the Stonehenge world heritage site will scrutinised by experts today when they visit the monument. The government unveiled the proposal last year as part of a £2billion project to dual the A303 from Amesbury to Honiton, Devon. Heritage officials from Unesco and the International Council on Monuments and Sites (Icomos) were invited to visit the site by the Department for Culture, Media and Sport. They will meet with stakeholders including English Heritage and Wiltshire Council. Ian Wilson from the National Trust said: “They will be spending several days here getting to know the landscape and the outline proposals. 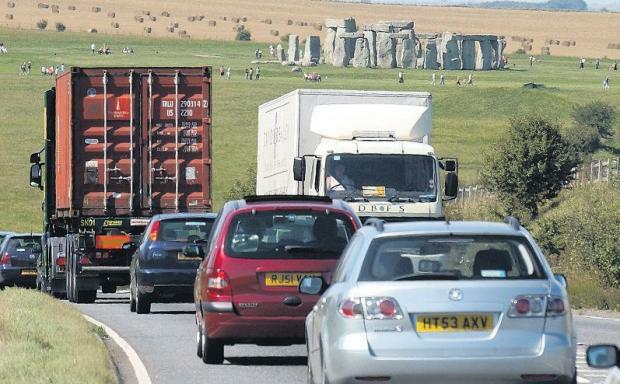 It is expected further trips will be made to Stonehenge as the plans become finalised.